Occupation: Naomi Gailson is Medus Tenpenny’s assistant. She is cold and professional, which makes it easier for Medus to act as he needs to. Family: Adopted Father: Joel Gailson. Adopted Sister: Rose Glenhill. Hair: She has blonde hair. Naomi’s hair is cut in a short bob cut. It has never been worn long and never will be. Unlike most of the people in her tribe, Naomi has had little to no contact with other Light Faye; therefore, their culture remains alien to her. 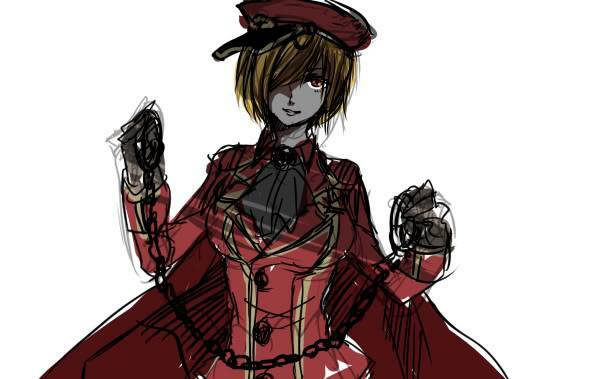 General Appearance: Naomi looks professional and uniformed, just like Medus. She has a no-nonsense attitude on her face most of the time. Strengths: Naomi’s a specialist in physical combat and employs runic sorcery on her limbs, hands, and feet to increase her fighting potential. Coordination: Her training has granted Naomi exceptional speed and precision. This makes for precise killing blows and attacks. Weaknesses: Her attacks must be close ranged. She has not learned any non-rune spells from her father. Therefore, attacks such as Embera Lightening can be a major hindrance. Current Goal/Purpose: Naomi is Medus’ right hand “man” in the plotline. Ever since he became the leader of the Yellow Brothers Gang, she has been by his side. It is uncertain if Medus and her in a relationship. The Category wants Medus on their elite team known as Unit Zero. Medus is “missing” and it is Skie’s goal to find him. Naomi has heard rumors about this young woman since she is a rather flamboyant gambler. She distrusts this girl and will keep Medus safe at all costs. Aspirations: To find her perfect mate. Hobbies: Sword fighting, reading, playing war games, exercise. Likes: She likes puzzles and other brain teasing games. Dislikes: People that aren’t well organized the Category, and Skie. Talents: Sword play. She spends most of her time training with her blade; so much so, she is considered the best Light Faye duelist in the pirating world. Inabilities: She worries about many things, which can distract her at times. She is often a loner. Fears: Her biggest fears are that is will just get in the way of Medus, whom is the only person she respects closely. General Personality: Naomi is a fairly serious, kind, and hardworking individual, who possesses a strong sense of justice. She can be short-tempered, yet still calculating. While she presents herself as a strong-willed and mature woman, in truth she is actually rather lonely. She is generally a charming, witty, realistic, down-to-earth, honest, dedicated, helpful, gentle, organized, systematic, and perfectionist type of person. Out of these characteristics come the not-so-good things about her include restless, anxious, worrisome, dogmatic, cranky, irritable, and very critical. Fondest Memory: The first time she met Medus. Biggest Regret: Being worrisome, there are too many to mention. Secret: Her adopted father Joel is trying to push her to marry Medus, that way his family will have some major influence in the generations to come. Special Items: The Blue cloak she wears might have belonged to Rane. It grants her limited protection from high level magic. However, it is effectiveness is out of her control, since it has a will of its own. Weapons: Naomi has an assortment of swords, daggers, and knives at her disposal. Normally, she prefers going in attacking with daggers since she likes fighting amongst the shadows instead of revealing herself to her foes. This cannot always be done, so she carries several throwing knives on her for distant attacks. Often times Medus will order her to carry a firearm. While he respects her fighting styles, he does not like seeing her risk her life just for him. Magic: She does not imply offensive spells, believing that using too much magic takes away from true combat. The few spells she uses are which is Blinding Light. Naomi can overwhelm opponents’ visualization to the point where they are blinded by light. General History: Naomi is a rather mysterious figure and little is known about her past. Her weak mother died soon after giving birth to her, while her father had left her mother before she was born. She was adopted by Joel, after he spent some time in the Kingdom of the Springs. He was the one that gave her the name of Namida, because he felt that she was often sad and had tears in her heart. Therefore, Naomi was raised by Joel. Since he is an older man, he could not always fight the battles that the Yellow Brothers required from him. At the age of 14, Naomi started training to be a swordsman for the Pirate gang. Also at this time, Joel was the 1st Mate on the airship, SS Beautiful World and therefore, Naomi had some close encounters with various officers of the trade. After Medus Tenpenny graduated from the Category’s Academy, he decided to spend some time with Joel, since he was a close friend of his mother. There he first met Naomi. Both shared similar world views and became close friends. Medus impressed Naomi with his reliability and integrity, which she found very refreshing and is something they had in common. Medus Tenpenny started to attempt to form his current trade empire at the age of 19. Naomi was 21 at the time. Both her and Joel saw great potential in him and supported his cause. She has been at his side ever since. These two have so much in common; their viewpoint on the world is so similar, that they may be each other's only friend. When Medus and Naomi get together they have an affinity for each other that is incomprehensible to other people. There is something very pure there. Joel wants to woo his daughter to Medus because of these facts. However, it is one of those relationships where they will live together rather than marry. They have their lives in good working order and simply want to share compatible areas of interest without any drama, but the bond is real.